English Full Cheek Snaffle Horse Bits at Tack Warehouse. 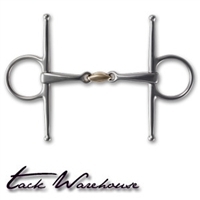 Shop â€‹Tack Warehouse for BEST Prices & Selection! 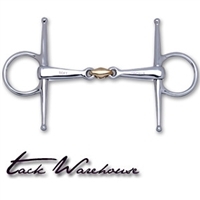 English Full Cheek Snaffle Horse Bits at Tack Warehouse. Shop Tack Warehouse for BEST Prices & Selection! • If you buckle the more angular side of the bit towards the horse’s tongue, the pressure occurs more selectively. • If you buckle the round side towards the horse’s tongue, you have a softer impact. Top-class and professional show jumpers inspired us in the development of the EZ-CONTROL-BIT. Their horses (show jumpers) often have a very strong impulsion, making it difficult at times for the rider to bring the horse back before each jump. A sweet copper link offers better acceptance because it encourages the horse to chew, thus enhances the saliva production. It has a massive copper composition (90% Copper, 7% Iron + Aluminum, No Nickel) with very high strength (stronger than Argentan). Horses feel good with a sweet copper link.